General Ricardo Sanchez Elementary held its “Meet the Teacher” event on Thursday, Sept. 10, 2010 which proved to be a great success. It gave parents and teachers the opportunity to meet and connect as well as work together to help his/her child meet their goals. Teachers were able to inform parents about classroom regulations, procedures and expectations and parents were able to voice any concerns or questions they had. Additionally, this event provided students the opportunity to share some of their work displays and projects with their parents. 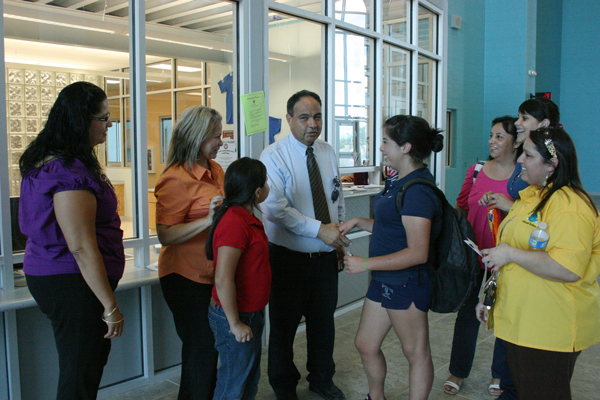 Parents were invited to visit the new RGCCISD Grulla High School to meet the teachers on Tuesday September 14, 2010. Many parents and community members took the opportunity to visit with teachers and to tour the new campus. School administrators and counselors were also available to welcome and meet the parents. Parents were excited and amazed with the beautiful state of the art facility. The classrooms are spacious, comfortable and conducive for instruction. The courtyard is equipped with benches where students may sit and work on class assignments or just take in the breathtaking views. Dr. Pablo Martinez, Principal, personally greeted parents and thanked them for their support of the students. (RGCCISD Photo).